NOAA ocean explorers used an advanced multibeam sonar mapping system on NOAA Ship Okeanos Explorer last month to discover and map the first deepwater gas seeps found off the U.S. Atlantic Coast north of Cape Hatteras. The seeps were found at water depths greater than 1,000 meters (3,300 feet). Based on preliminary information, scientists believe the seeps are likely emitting methane gas. Locating seeps with this advanced technology will expand opportunities for researchers to study how seeps in the deep ocean environment affect ocean chemistry. "Finding and mapping deep ocean seeps is vitally important but has been limited by technology," said Stephen Hammond, Ph.D., acting chief scientist in NOAA's Office of Ocean Exploration and Research. "With advanced multibeam sonar, it may become routine to discover seeps while we systematically explore our poorly-known ocean." NOAA's use of advanced technology to discover seeps will benefit other agencies, including the U.S. Geological Survey (USGS). "It's important to find and understand such seeps because they have global significance for the transfer of methane carbon from long-term storage in ocean-floor sediments into the ocean and atmosphere," said Carolyn Ruppel, Ph.D., chief of the USGS' Gas Hydrates Project. "Methane released into the water column is often oxidized to carbon dioxide, leading to changes in ocean chemistry, such as ocean acidification." The seeps were mapped between Nov. 2 and 20 at three locations with water depths of 1,000 to 1,600 meters (3,300 to 5,250 feet). Approximately 25 distinct seafloor gas seeps were identified based on plumes rising into the water column as high as 1,100 meters (3,600 feet). 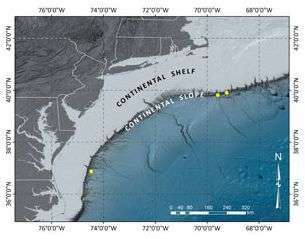 The sites are between 147 and 163 kilometers (91 and 101 miles) off shore, with one site east of Cape Henry, Va., and two sites south and southeast of Nantucket Island, Mass. "NOAA tested the ship's multibeam sonar last year in the Gulf of Mexico and confirmed its advanced signal processing made it a highly capable new tool to detect gaseous seeps at great depths and over wide areas," said Robert Detrick, Ph.D., assistant administrator of NOAA Research. "This technology and the information it delivers is extremely valuable to researchers and ocean resource managers in NOAA, in other agencies, and across the nation." Further descriptions of the deepwater seep expeditions are on the Ocean Explorer website for the Northeast and Mid-Atlantic Canyons Expedition and 2011 Gulf of Mexico Expedition. Single beam sonar systems have been used extensively to map gas seeps but do not provide as much coverage as typically collected by multibeam systems. Multibeam sonar obtains information from a fan-shape of beams, mapping a wider area more quickly and efficiently. Most multibeam sonars cannot process sonar signals from water-column seeps but the multibeam sonar on Okeanos Explorer is one of the few that is specially configured to do so. Stuff like this is a big deal in science and yet it gets overlooked because of flashier articles. We are seeing the srface of our own planet! If you listen to the AGW choir, humans are responsible for ocean acidification. Now we find out there are other causes as well. Go figure! The moral to the story is never take the doom and gloom and "humans are the root of all evil" song of the AGW choir seriously. We made 7 parts per million equivalent of CO2 last year, and the global concentration rose by 2 PPM. Clearly if we made less CO2 it wouldn't be rising much, if at all. Hydrocarbons leaking into the ocean? Time to fine Mother Earth a few billion $ to pay for the cleanup! 7 parts per million what? gallons of ocean water?? tons of ocean water?? Please clarify. Sounds like we need to drill some methane pressure relief wells, that way the gas currently leaking into the oceans would decrease and the ph would stop changing. Damn...where are the capitalists when you need them!? OMG! Not more methane seeping into the atmosphere. For immediate global warming that is not good. AGW would just compound the issue as additional green house gasses would be added to the current green house gas crisis that exist today. It sure is comforting that scientific discoveries have no effect on past predictions. I would hate to think we didn't know everything about climate science before we set policy and ramped up the environmental propaganda machine. Not sure why ScooterG is linking methane with pH. The hydrogens on methane are hard to pull off and thus methane does not perform acid/base chemistry under normal conditions. From the article above: "Methane released into the water column is often oxidized to carbon dioxide, leading to changes in ocean chemistry, such as ocean acidification." 'Ocean acidification' is a myth, based on misunderstandings of chemistry in aqueous systems. Dissolving CO2 in water increases the total concentration of oxidized carbon in the water. Le Chatelier's Principle dictates that the CO2 will hydrate immediately to H2CO3, which will immediately produce more HCO3- ions (bicarbonate) than H2CO3 (carbonic acid) when the pH is above 6.37 (almost *always* true in the oceans). Bicarbonate is what the corals NEED to build reefs, and the mulloscs need for their shell-building. The seas are normally alkaline, with pH between 7 and 9, and most dissolved carbonate is present as bicarbonate ion, and only a trace (<10%) is present as carbonic acid or as carbonate ion. What is being called 'acidification' is actually neutralization. True tadchem, but it doesn't take much NO2 or Sulfur compounds to be in the mix before noticeable changes in Ph occur. Sulfur emissions from the Midwest's coal fired electrical plants was a common source of the acid rains that was devastating the forests in the Appalachian mountains. We are seeing the same in China down-wind of their coal fire plants. Regardless; given how many gigatons of excess CO2 that has been dumped into the air, and the fact that atmospheric CO2 levels have risen to only 400ppm gives testament to just how much CO2 the oceans have absorbed. Chances are any acidification of the oceans will probably occur in the shallowest areas. The very places that are most environmentally sensitive to changes like acidification. So surface waters, and coral reefs are two threatened areas in the oceans by extreme CO2 induced acidification damage. Both major food sources.